Kees van Wees (8) of Ridgefield scored a goal during the boys FCIAC Championship game between Ridgefield High School and Greenwich High School on March 2, 2019 at the Dorothy Hamil Arena in Greenwich, CT.
GREENWICH — Ridgefield is already a tough team to defend at even strength, but when it’s on a power play, watch out. 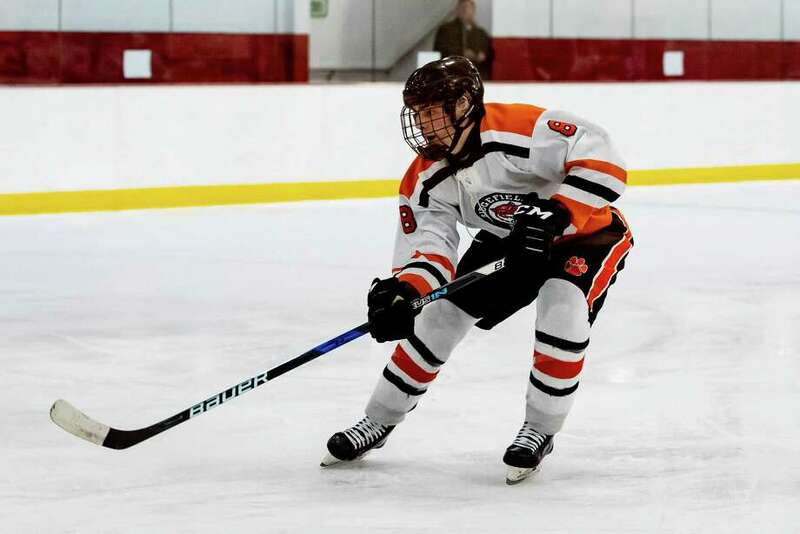 The Tigers put on a power play execution clinic during Saturday’s FCIAC boys hockey tournament final against Greenwich and in the process kept their streaks of superiority alive. Scoring five power play goals, top-seeded Ridgefield won the FCIAC tournament title for the third straight season, posting a decisive 8-1 victory over sixth-seeded Greenwich in a physical, hard-hitting, penalty-filled game at Dorothy Hamill Skating Rink. Besides earning a sweet three-peat, the Tigers, ranked No. 1 in the GameTimeCT poll, continued their perfect season, raising their record to 22-0. Junior forward Kees van Wees scored a team-high four goals, including the last three tallies, for the champion Tigers. Senior forward Will Forrest, was named the MVP of the championship game, registered three goals and one assist for Ridgefield, which claimed its eighth FCIAC title. Saturday night’s showdown was a rematch of last season’s FCIAC final, which saw Ridgefield notch a 6-4 win against Greenwich. Greenwich (11-10-2), which defeated New Canaan and Darien on its way to reaching the tournament’s championship game, received a goal from senior forward Matt Davey. The Cardinals, who dropped a 5-2 regular-season decision to the Tigers, trailed 3-0 after the opening period and 7-1 after the second. On a 5-on-3 power play, after Greenwich was charged with roughing and interference penalties, the Tigers scored the game’s first goal with 12:52 remaining in the opening period. Receiving a pass from van Wees at the right post, Forrest got the puck past GHS freshman goalie Charlie Zolin, giving Ridgefield a 1-0 lead. Still on a power play, Ridgefield gained a 2-0 edge on van Wees’ wraparound goal at the 11:33 mark. The Tigers benefited from another power-play opportunity later in the first period. Forrest went top shelf with his snap shot from the left face-off circle, putting Ridgefield on top, 3-0, with 4:13 still left in the first period. The Tigers and Cardinals combined for 28 penalties and GHS cashed in on one for their lone goal of the matchup. With the Cardinals on a two-man advantage, Davey gathered the puck on a shot from senior Nic Pellettier-Martinelli that bounded off the boards and knocked it past Ridgefield senior goalie Sean Gordon at the 10:16 mark of the second period. Any momentum Greenwich gained with its tally was lost, when Ridgefield scored three goals over 2:53 span. Following a five-minute major infraction by Greenwich, Forrest converted a one-timer with 7:09 to go in the second period, then senior forward Nick Cullinan snapped a shot home from the right wing at the 5:28 mark, making it 5-1. Van Wees tallied twice in the second period, giving the Tigers a commanding 7-1 lead. Supported by the strong play of his defensemen in front of him, including seniors Simon van Wees and Brady McSpedon, Gordon made 14 saves in goal. Zolin made 15 saves for Greenwich, before giving way to junior Ben Nash in goal (three saves). Forrest, the MVP, helped set the tone of the game, getting his squad off to a fast start. Scoring: First period — R: Will Forrest (Kees van Wees, Matt Walker) 12:52; van Wees (Walker, Forrest) 11:33; Forrest (Nick Cullinan). Second period — R: Forrest (van Wees) 7:09; Cullinan (van Wees, Daniel Parson) 5:28; van Wees (Matt Walker) 4:16; van Wees (Simon van Wees, Cullinan) 1:51; G — Matt Davey (Nick Columbo, Nic Pelletier-Martinelli) 10:16. Third period — R: Kees van Wees (Owen Luft, Logan Chang) 8:35; Goalies: R — Sean Gordon (14 saves); G — Charlie Zolin (15 saves), Ben Nash (5 saves).